High Holiday Welcome Program 5777 is Now Open! The Greater Miami Jewish Federation and the Rabbinical Association of Greater Miami’s High Holiday Welcome Program offers free worship services so that every Jewish person in Miami-Dade County can experience the richness of Rosh Hashanah and Yom Kippur. 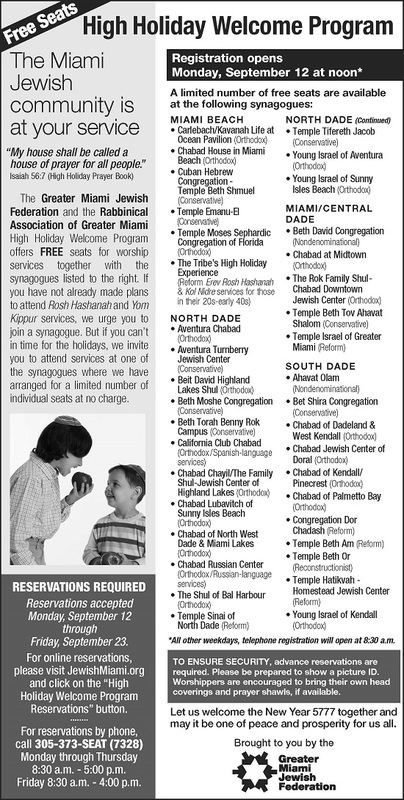 Together with participating synagogues, the program makes available a limited number of individual seats at no charge. Seating registration is now open until Friday, September 23, online at JewishMiami.org/HighHolidays or over the phone at 305-373-7328 (SEAT). The phone line will operate September 12, from 12 noon - 5pm, all other weekdays Monday - Thursday 8:30 am – 5 pm, Fridays 8:30 am – 4 pm. If you have not already made plans to attend Rosh Hashanah and Yom Kippur services, we encourage you to join a synagogue. But if you can't in time for the holidays, we invite you to join us at services offered through the High Holiday Welcome Program. The Greater Miami Jewish Federation wishes you Shana Tova and may the year ahead be filled with health, happiness, and sweet moments for you and your family. WIZO FL Presents Dennis Prager September 21st! JOIN WIZO FLORIDA'S OPENING CAMPAIGN DINNER on Wednesday, September 21 at 7:30pm at the Aventura Turnberry Jewish Center and hear all about "WHY ISRAEL IS ALL ALONE IN THE WORLD" with Keynote Speaker Dennis Prager. CLICK HERE to purchase your tickets - Couvert - $180 pp / Young Adults $ 90 / pp or call the WIZO Florida office for further details 305.861.8860. Celebrating Past, Present and Future WIZO Supporters. This is going to be an incredible evening that you don't want to miss! Col. Eran Lerman, former member of the Israeli National Security Council, discusses how totalitarian ideologies of Nazism, Communism, and Islamism anchor hate in the Israeli-Palestinian conflict. A program of ISGAP. A certified scribe will be visiting the community checking Mezuzas & Tefillin. He will only be with us for a few hours, so his time is limited. To make sure you reserve a spot to have yours checked, please call ahead. He charges $9 per Mezuzah and $55 for Tefillin ($80 Gasos). Discounts & payment plans available to anyone that needs. Go to ChabadChayil.org The scribe will be at the Shul from 10:00 am. Limited slots available. We would like to invite all Jewish Teens (8th-12th grade) to join us at our annual BBYO Kickoff Party! Sign up now for one of the most anticipated BBYO events of the year! You can take advantage of our early bird pricing of $35 by registering before September 9th. To register, click HERE. For more details on this event, see the flyer below. 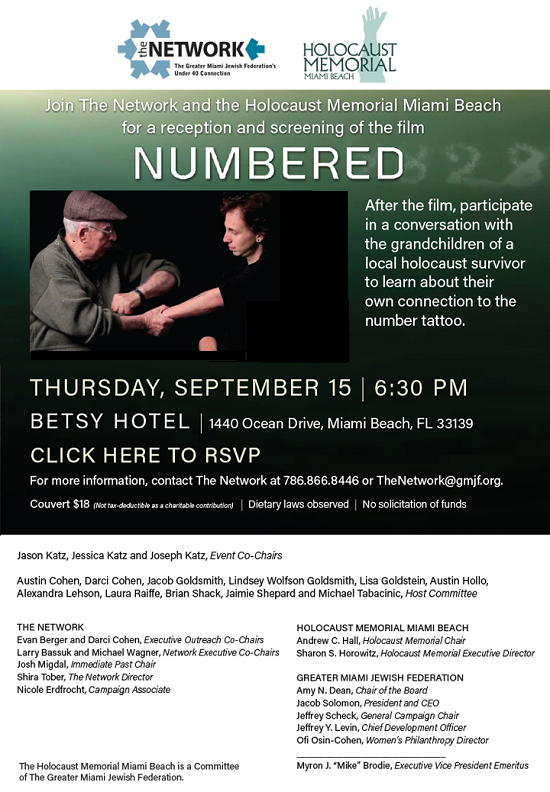 Join The Network and Holocaust Memorial Miami Beach for a film screening of “Numbered”. After the film participate in a conversation with the grandchildren of a local holocaust survivor to learn about their connection to the number tattoo. Seating registration will begin Monday, September 12, and end Friday, September 23, online at JewishMiami.org or over the phone at 305-373-7328 (SEAT). The phone line will operate September 12, from 12 noon - 5pm, all other weekdays Monday - Thursday 8:30am - 5pm, Fridays 8:30am - 4pm. If you have not already made plans to attend Rosh Hashanah and Yom Kippur services, we encourage you to join a synagogue. But if you can't in time for the holidays, we invite you to join us at services offered through the High Holiday Welcome Program. The Greater Miami Jewish Federation wishes you Shana Tova and may the year ahead be filled with health, happiness, and sweet moments for you and your family. Hot Pizza or other food will be served at the kick-off event for the hottest club in town. Find out why going to CTeen is Fresh, Funky and Cool! When you are at CTeen you are helping people, growing, learning new things, and having a blast! Sign up at ChabadChayil.org/cTeen or just come to the Kick-off Event on Sept 13! Dr. Feldman is a board certified child psychologist who has many years experience in helping parents & children. Q&A Session will follow lecture. No charge. Optional donation of any amount. 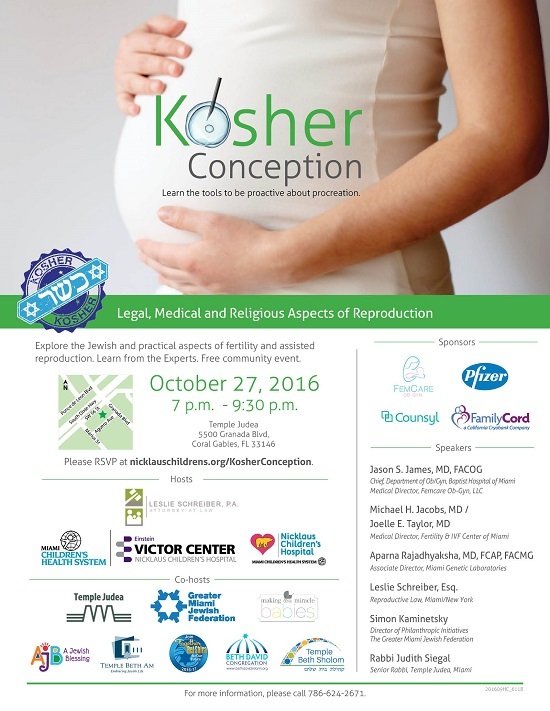 Explore the Jewish and practical aspects of fertility and assisted reproduction. Learn from the experts.